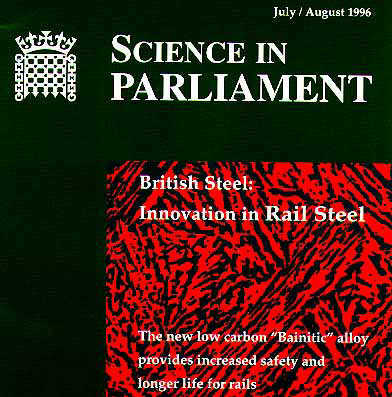 "This novel low carbon bainitic alloy was developed in collaboration with Cambridge University and has been patented world-wide"
This article was published originally in Science in Parliament. It is reproduced with permission. This presentation has been adapted for the world wide web and enhanced for teaching purposes. The first steel rails used anywhere in the world were laid in Derby station on the Midland Railway in 1857. The metallurgical structure of those rails was essentially the same as that of the rail steel still used today - a pearlitic structure based on a carbon/manganese composition. Pearlite comprises a mixture of relatively soft ferrite and a hard, brittle iron carbide called cementite, taking the form of roughly parallel plates. It achieves a good resistance to wear because of the hard carbide and some degree of toughness as a result of the ferrite's ability to flow in an elastic/plastic manner. Microstructure of PEARLITIC rail steel. 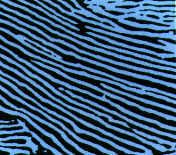 The interlamellar spacing is about 0.3 micrometres. This is a colour enhanced image in which the cementite is light blue and the ferrite is black. the steel is "cleaner", with fewer stress-concentrating entrapped inclusions from the steelmaking and casting process. The first British Standard for rail steel manufacture was BS11 issued in 1903 which required a minimum tensile strength of 618 N mm-2. (It is interesting to note that four of the first eleven British Standards written were on rails or railways, indicating their importance to the country's industrial development at the turn of the century). Since then, there have been twelve revisions leading to the current 1985 edition. Strength requirements are now 710 N mm-2 for the "Normal" grade and 880 N mm-2 for the so called "Wear Resistant" grade. The last 20 years have seen further increases in strength, mainly to cater for the heavy axle loads of North America and "Premium" rails of around 1300/1400 N mm-2 tensile strength, (1 N = 0.102 kg force) are now used in large quantities. They are finding increasing use in European railways in tight curve/high wear situations. THese high strengths are achieved by making the spacing between the pearlite lamellae finer by controlling the growth rate of pearlite. Alloying elements such as chromium and nickel can be added to some rail steels to improve properties. Alternatively, the rail can be cooled quickly to reduce the time available for diffusion. The rail can also be heat treated. British Steels' rolling mill at Workington was the first European railmaker to introduce a heat treatment process in 1985. Combinations of alloying and heat treatment are possible and a range of grades can therefore be produced. 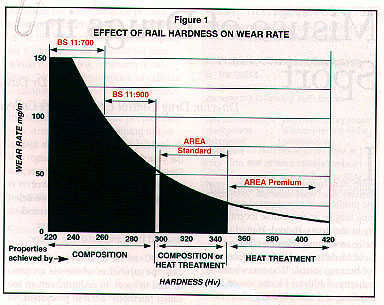 Figure 1 shows these in terms of hardness properties and the corresponding resistance to wear. A railway's choice of rail grade is made in terms of traffic and track conditions and excellent service life can be achieved, particularly if modern rail head lubrication and grinding practices are used. Figure 1: Plot of the wear rate (mg m-1) versus hardness (HV) of rail steel. Hardness is the ability of the material to resist penetration by a specified indentor. Rails not only wear, they also break. Their inherent toughness is poor as a result of the presence of the brittle carbide phase. Fracture can occur from relatively minor stress-concentrating features inside the rail, or on the surface, as a result of manufacture or subsequent handling damage. At least one European railway network suffers almost 4000 rail fractures every year. These are rarely dangerous, as modern track signalling systems and routine inspections will find most. They do however have a high replacement cost and can be very disruptive to the network. Pearlitic rails have been developed almost to their limit and British Steel as a major supplier to the world market therefore asked itself, "What other structures are available? Do any offer better properties?" The answer is "yes". "Steel" is an extremely versatile material. If a suitable series of small alloying additions are made, or the correct heat treatment chosen, then other types of structures can be produced. Correct choice of alloys and an intermediate cooling rate can produce a bainitic structure. This structure, like pearlite, normally contains ferrite and carbide, but in this case the ferrite is semi-coherent with the high temperature austenite phase from which it was formed. 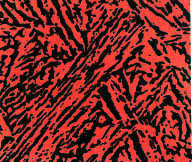 Microstructure of BAINITIC rail steel. The width of red layers is about 0.8 micrometres. This is an optical micrograph which does not reveal the true fine structure of the bainite which contains plates that have dimensions less than 0.2 micrometres (a higher resolution transmission electron micrograph is available showing these fine plates with intervening austenite films Figure.). Alloying additions are made to prevent the formation of carbides, resulting in very fine interlath films of austenite which are retained between the ferrite plates. The structure is composed largely of low carbon carbide free bainite with some retained austenite Figure. This novel low carbon bainitic alloy was developed in collaboration with Cambridge University and has been patented world-wide. The new steel has the advantage of forming the desired structure under normal conditions after rolling the rail. The first casts made were aimed at a similar strength to conventional heat treated rails. The new grade shows a dramatic step change in toughness. The new grade shows a dramatic change in toughness. Figure 2 illustrates the improvement, across the whole range of temperatures encountered by the world's railways. At low temperatures, where rails are most vulnerable to fracture, for example, properties are improved by a factor of 5 to 1 at 0 °C. Plot of the impact toughness of bainitic and pearlitic rails. A larger Charpy value indicates a greater ability to withstand impact deformation and a lower sensitivity to concentrations of stress. More modern fracture toughness tests, which tend to group all pearlitic rails in the same low range, show significant improvement. This improvement in toughness significantly increases the size of crack which can be tolerated in service without causing fracture - by up to 2.7 times, making it easier to find defects and replace rails in a controlled manner. 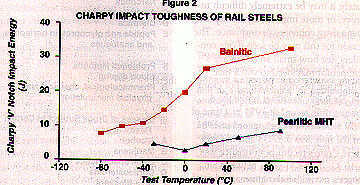 Table showing the fracture toughness of pearlitic and bainitic rail steels. The larger the toughness the greater the size of cracks that can be tolerated without failure. For similar hardness levels the bainitic grade shows a reduction of 4 to 1 in rate of wear in the laboratory and only slightly less under more complex track conditions. Also the laboratory tests indicate potential benefits for reduced wheel wear for the new bainitic grade. Full wheel size wear tests are currently being undertaken. The formation of very fine surface cracks by a phenomenon of rolling contact fatigue is of increasing concern to European railways. In separate trials in the UK and at a recognised European railway test centre for full scale testing, the new bainitic steel showed dramatic improvements in comparison to the traditional pearlitic rail. The whole wheel/rail test showed crack initiation at two hundred and twenty thousand cycles on traditional pearlitic premium rail, whereas after one million cycles the new rail steel was crack free when the test was terminated to permit further trials to take place. The new steel is in service in British Steel Scunthorpe's Works industrial track with conventional (25 tonne) and heavy (50 tonne) axle loads and is performing as the laboratory tests would indicate. The new steel therefore shows considerable potential in terms of life in track, reduced maintenance, increased safety, with anticipated reduction in rail fractures. Testing which began in 1995 in industrial track will be extended to the USA's Facility for Accelerated Service Testing (FAST) track in Pueblo, Colorado later this year. Following anticipated successful results at FAST, trials will take place with selected railways in the Spring of 1997.